For the fans of the baroque, seeing a Pope wear a baroque form of Roman chasuble has been a rare sighting in recent decades. 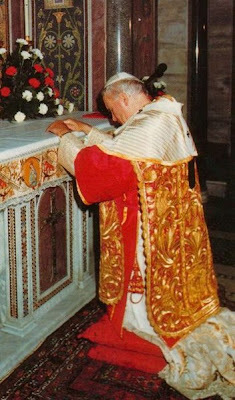 John Paul II did it at least once earlier on in his pontificate, even using the "fanon" and wearing the pontifical dalmatic underneath, but to my knowledge it hasn't been seen since. For those interested in these visible signs of continuity with the Church's history, coming from the Pope, your time may come soon. The Holy Father will visit Brindisi in Apulia on June 14-15th of this year and a reader has pointed out to the NLM that a suggestion has been made that the Pope wear a set of vestments of Pope Benedict XIII, a pope from Apulia, which were worn on the occasion of the canonization of Saints Aloysius Gonzaga, Stanislaus Kostka, John of the Cross and Turibio de Mongrovejo in 1726. These vestments were given by Benedict XIII to the Parish Church of Gravina, his home town. The present Archbishop of Brindisi, Msgr. Rocco Talucci, has enthusiastically embraced the idea, seeing it likewise as "a great signal of continuity with the glorious history of the Church which many in this era would like to erase" (Source: Petrus). The Archbishop has reportedly stated that he would bring the matter to an assembly of the Bishops of Apulia this month, asking the Bishop of Gravina to make the vestments available for the Pope's use, provided Msgr. Guido Marini approves. Evidently this is yet merely a proposal, but this proposal affords me an opportunity to address a few issues that consistently come up on the part of some of our readership when topics as these are addressed. Evidently some will find this sort of matter of little or no interest -- as much as others might have little interest in differences in chant interpretation, the history of the different liturgical rites, the finer points of sacred architecture and so on. At the end of the day, not everyone has to be deeply interested in all of these things -- though I am thankful there are people who are deeply interested in these and other matters; I think that is not only good but also important. That said, we should always make certain that any lack of personal interest (or even simply our own lack of knowledge) in these or other areas never translates into devaluation or the assumption that these are not without some deeper importance or relevance. Some react in a negative way at any consideration or focus upon these aspects of the Church's life. To them, it can seem all too external, rooted in matters that do not belong to the deposit of Faith. Why then exert any effort in drawing attention to these matters? Are they not, after all, unimportant? Not only then is there an interest in seeing the sacred mysteries clothed in dignity and beauty worthy of their spiritual value, but in the light of the particular times, these are also understood as important by virtue of being a visible signs of continuity in the face of an all-too-often ruptured view of the Church's history.